Do you experience a peculiar chest pain that tends to worsen whenever you swallow or take a breath? If you are, you might be suffering from Pneumomediastinum (PM), a discomforting respiratory disorder. Read and know all about the causes, symptoms, diagnosis and treatment of this disease. Both types result from events that cause air to escape from lungs, bowel or airways into the chest cavity. A blunt blow or a penetrating chest trauma, iatrogenic injury or esophageal perforation can cause serious and traumatic pneumomediastinum. This is a rare disorder occurring due to leakage of gas or air from the lungs or airways and its subsequent entry into the mediastinum. The condition often results from the breakage of small air sacs, known as alveoli, which causes leakage of air. The condition may or may not cause any problems. The symptoms, if any, principally include severe pain around the central chest (below the breastbone) that may later spread to the arms or neck. As aforementioned, the pain may grow worse while breathing air or swallowing food. Other symptoms consist of labored breathing, subcutaneous emphysema and voice distortion. During diagnosis, a doctor may look for small air bubbles under the skin in the chest, neck or arms area. 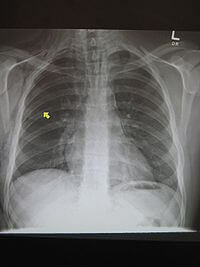 A CT scan or x-ray of the chest can be conducted to confirm the presence of air or gas in the mediastinum. This may also help locate a hole in the esophagus or trachea. Most cases of this disease do not require any treatment as the tissues present in the mediastinum, over a period of time, slowly reabsorb the air in cavity. Inhaling high amounts of pure oxygen may also speed up the air absorption process. If there is air pressure which causes compression of the heart, doctors may insert a needle in the cavity to release the air. Patients having a hole in the esophagus, trachea or bowel may need an operative procedure for surgical repairment. In case of a collapsed lung or pneumothorax, doctors may decide to use a chest tube. The outcome of the disease is generally good as the air in the mediastinum is frequently absorbed by the surrounding tissues. However, recurrence of the condition is deemed to be risky. Possibilities of morbidity or mortality mainly depend on the causative factors of the disorder or the precipitating health condition of the patient. Possible lung collapse, due to build up of air in the mediastinum and subsequent pervading of the space around the lungs. Pneumopericardium, caused by entry of air into the space between the heart and the thin sac surrounding it. Hindering of effective functioning of the heart. This may occur due to uncommon buildup of air around the center of the chest that exerts great pressure on the heart and its blood vessels. 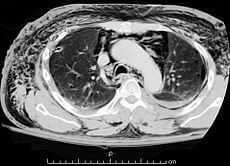 Pneumomediastinum can cause serious breathing difficulties or heart and lung problems in affected patients. Although the symptoms generally resolve naturally (due to absorption of air by the surrounding tissues), serious complications may also arise in some cases. An early diagnosis and medical attention helps prevent worsening of this disorder. An individual suffering from breathing difficulties or severe chest pain due to this disorder needs to consult a doctor on an immediate basis. Timely treatment can check the condition in time and help avoid serious health issues.